Tatascan is a Honduran puro made by cigar master Christian Eiroa’s father Julio. Manufactured by his independent company JRE Tobacco, Tatascan translates to “Head Boss”. This is a mild smoke with lots of flavor represented by various notes of graham cracker, pepper, caramel, and subtle hints of citrus in the last third. This 9 cigar sampler is an incredibly priced introduction to the Tatascan line thanks to our Outrageous Deals! The United States, in many ways, has been able to profit handsomely from the destruction of the Cuban cigar scene in the wake of the Cuban revolution, and Tatascan is just one of the many brands that follows this kind of story, and the people who most benefit from it are you and I; those who like cigars made in places where we can buy them without the worry of an embargo, and where we can enjoy them without worry or moral qualms. The family behind Tatascan cigars and the JRE Tobacco company follow a story that, if you know anything about cigars, you have heard before. They were a tobacco making family in Cuba, and then came the revolution. The family was exiled, and they came to the United States with all that tobacco knowledge and cigar ideas, selling boutique cigars for a number of years before finally getting into making their very own cigars and doing so in larger numbers. The Honduran Habano Sampler is a great cigar sampler that you can enjoy if you’re into Habano cigars. 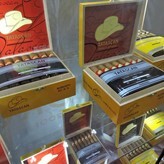 The entirety of the cigar is grown in Honduras, with a Habano wrapper, a Corojo binder, and a Habana and Corojo filler. This leads to a cigar that is both flavorful, a bit spicy, and one that you will find enjoyable again and again for years on end. If you’re looking for a new cigar company to give a chance to, this is the one that you are going to want to spend that money on.